Importing (loading) password hashes to the project. Editing the hashes: deleting, adding, selecting, etc. Recovering the hashes. 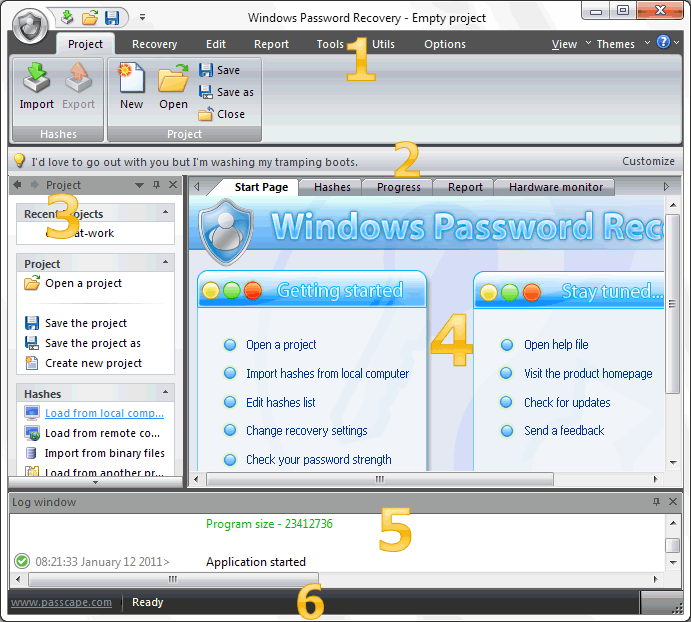 Includes selecting, configuring and launching the selected one or several attacks. Project - includes the main operations over the project - like the opening, closing, creating a new project, and importing hashes. Hash Editor. Duplicates the most common editing operations. Tools - includes a clock, calendar, and calculator. Main Window - bears the main burden and consists of 4 parts. The first tab is the welcome window. The second tab contains the list of hashes to be analyzed and recovered. Then there goes a tab with the current attack state (progress) indicator, a tab with the statistics/reports. And finally - a hardware monitor tab. Log Window - displays information on the current state of the application, current operation, etc. The program's log can be copied to the clipboard or saved to a file (right-clicking opens the corresponding menu). Status Bar is designed for informational purposes.